Ships From Hong Kong. Style: black lace. The fabric: Ultra-thin Lace. Product details: ventilation design is unique. The workmanship is exquisite and ventilation is well. Material is soft, comfortable to wear. It can protect the skin. When you go to outdoor sports with lace veil to protect the face and avoiding being sunburned in summer. It is cool to wear comfortably and breathable. Size: 8.3"*5.5". 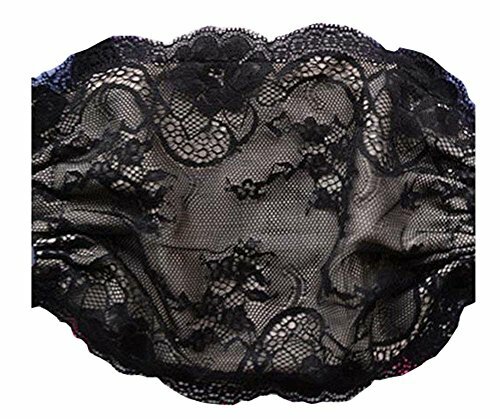 Style: black lace. Applicable seasons: summer.The fabric: Ultra-thin Lace. Wearing is cool not hot, deodorant and antibacterial effect is well. While you wear it can keep comfortable for a long time. The workmanship is exquisite and ventilation is well. The ventilation design is unique, it is cool to wear comfortably and breathably. Far infrared and UV resistant function is well, being well protect the skin. Soft lace veil will not affect breathing and speaking. When you go to outdoor sports with masks to protect the face, dust-proof, UV protection, anti-fog, sun protection, anti exhaust and avoiding being sunburned effect is very good.